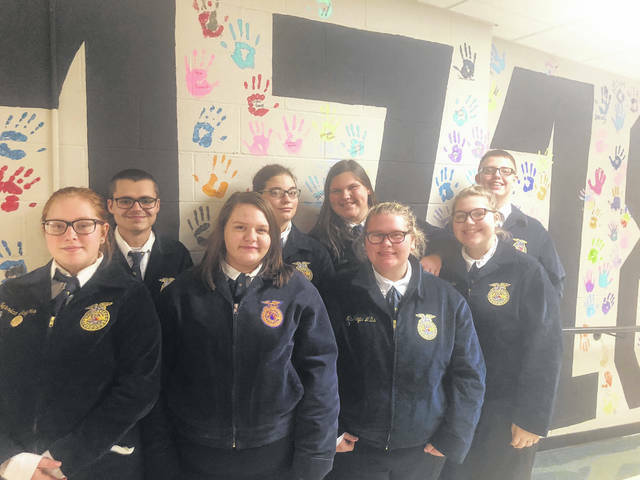 Pictured are the Food Science teams: back from left, Zack Collins, McKinley Preece, Ashlyn Dunn, Payton Stambaugh, front from left, Jess Salyers, Lacy Ratcliff, McKayla Mills and Taylor Cordial. On Nov. 6, Urbana FFA competed at a sub-district food science and job interview contest hosted at Graham High School. The food science team of Ashlyn Dunn, McKayla Mills, Jess Salyers and Mckinley Preece placed 5th. The second team of Zach Collins, Taylor Cordial, Lacy Ratcliff and Payton Stambaugh placed 11th. The contest consisted of a written exam, which tests the students knowledge of the basic principles of food science and food technology. There is also a customer complaint letter where one must reply to the upset customer in a professional manner. Then students must look at pictures and decide whether or not there is something wrong with them. Then the different aromas are tested. Students must smell them and to determine what they are from. The categories range from fruits to spices. The last task to accomplish is the taste test of food. In doing this one tries three of the same item and choice which one is more significant than the others. The purpose of the Job Interview CDE is for FFA members to practice and demonstrate the skills needed in seeking employment in all areas of agriculture. Each part of this event simulates real world experiences that students will have when seeking employment in the future. They have to type a resume and cover letter, fill out an application, perform in an interview, then write a follow up letter afterwards. The contest is divided into five divisions. Kendra Baccus participated in division one (freshman), and placed 7th. Trey Williams placed 4th in division two. Peyton Tener competed in division three, placed 9th. In division four, Ashlyn Dunn placed 5th. We’d like to congratulate everyone on a job well done. Submitted by the Urbana FFA.